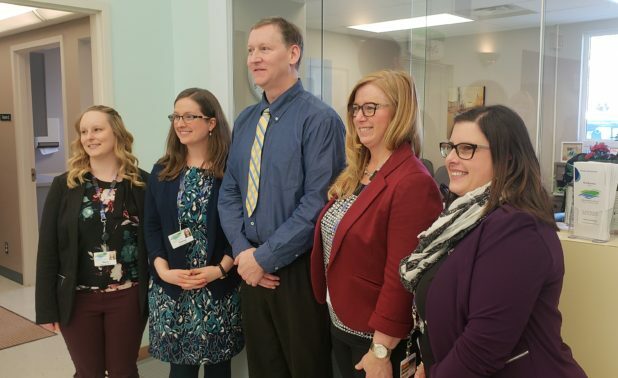 The waiting area of the new Madawaska Valley Family Health Team was full of smiling faces on Friday, Jan. 11 as dignitaries, physicians and community representatives gathered with staff to celebrate the official ribbon cutting for the new family health team. Dr. Alex Otfield, who was introduced as a driving force behind the project, highlighted the fact that it has only been about a year since the application for the new family health team was submitted. Local physicians have collectively enrolled over 1,000 patients in the past six months and on Dec. 10, 2018, the FHT began seeing its first patients. The FHT currently includes two nurse practitioners Craig O’Brien and Tierney Lunney who work in cooperation with local physicians. Recruitment is actively underway for one full-time social worker, a part-time dietitian and part-time physiotherapist, according to executive director Susan Farrar. Beginning Monday, Jan. 14, the FHT will begin taking a limited number of urgent care patients for those who do not currently have a family doctor. Service covers a wide area from Whitney to Eganville, Combermere and Madawaska Valley. Funding for the FHT has come through the Ontario Ministry of Health and the Champlain LHIN. Dr. Otfield expressed his hope that this new FHT in Madawaska Valley will be the start of a new wave of family health teams across the province. The Ministry and the LHIN identified our community as in need based on hard data, according to Otfield. Following the official ribbon cutting and official photos, attendees enjoyed refreshments and cake in celebration of this important milestone for the community.